Let’s talk about breakfast. The kind of breakfast that makes you happy to leap out of bed in the morning. 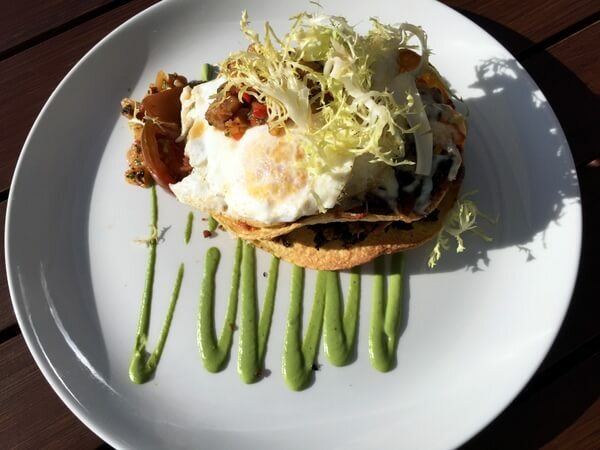 That’s the kind of breakfast they cook up at the Juniper Hotel and Bistro in Canada’s Banff National Park. 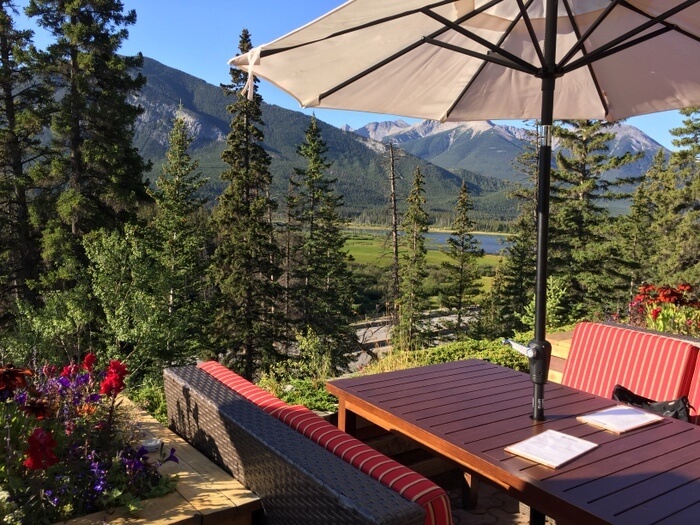 There are plenty of things to love about this fun hotel in one of Canada’s most spectacular destinations, from the great mountain views to the mid-century modern guest rooms. But I’d definitely come back for breakfast. 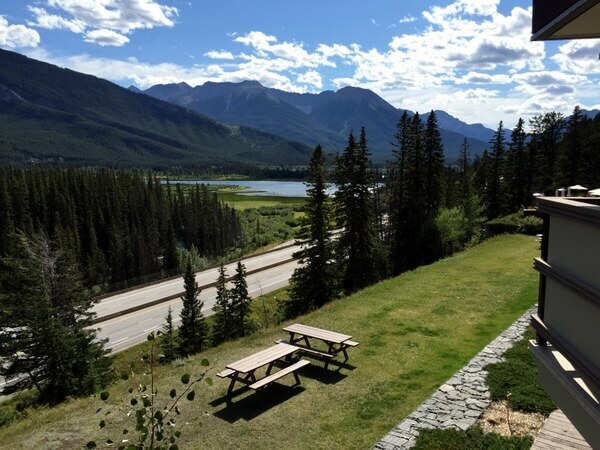 The Juniper Hotel and Bistro is located just off the Trans-Canada Highway, on the edge of the town of Banff. It’s at the base of the road up to the Mount Norquay Ski Area. The location is far quieter than being right in the center of town, but it’s a 1.2-mile (two-kilometer) walk if you want to head to town for a meal or other activities. The hotel does run a periodic shuttle — handy if you don’t want to deal with parking in town and you can accommodate to the shuttle schedule — but otherwise, it’s more convenient to have a car. The hotel’s design sense is clear from the public spaces, where locally-themed artwork and First Nations artifacts adorn the lobby and hallways. The restaurant and bar have a wall of windows offering spectacular views of the nearby mountains, which are even better from outdoors on the restaurant’s patio (where the top photo was taken). 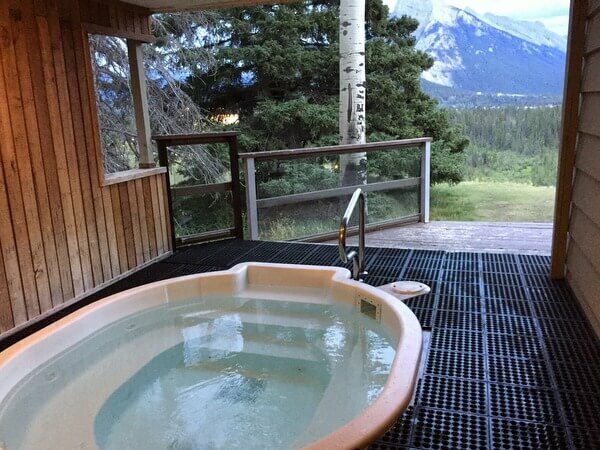 There’s no pool, but there is a small outdoor hot tub, sheltered from the elements, that has glimpses of the mountains, too. 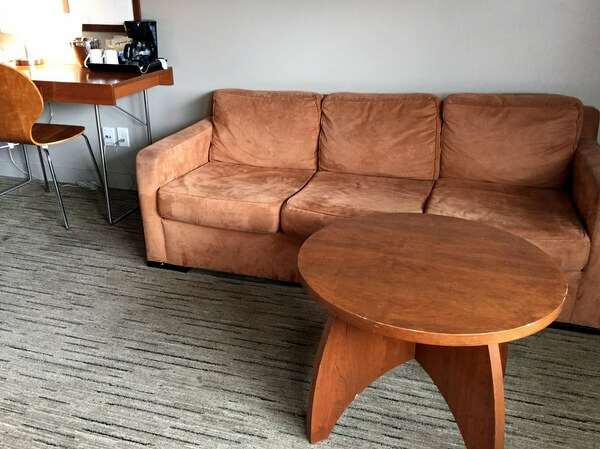 The two-story building that houses the Juniper Hotel and Bistro was originally built back in the 1950s, and the Juniper channels that mid-century modern style in its guest room decor. Furnishings are clean-lined cherry wood, with earth-toned upholstery accenting the standard white bedding. My room (#201) was a quiet unit at the end of the hallway. It was quite spacious with two double beds, as well as a sitting area with a sofa and chaise longue. An armoire held a flat-screen TV and a mini-fridge. The best of the 50 rooms are those facing the mountains, since that’s where you get the views. These units also have a patio or terrace where you can take in the mountain vistas (although from outside, you can sometimes hear the cars whizzing past on the Trans-Canada Highway). The rooms on the other side of the building look across the parking lot to the surrounding forests. 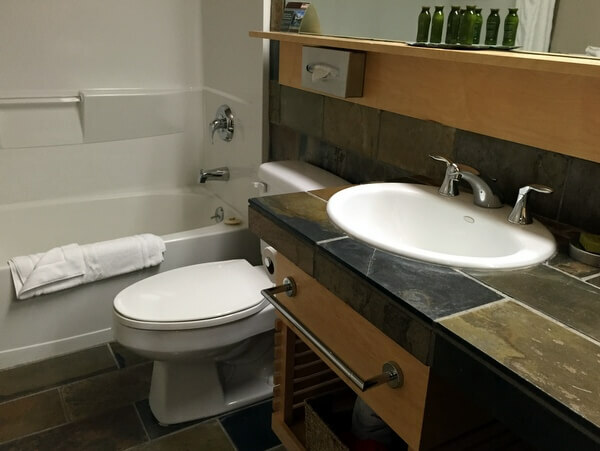 Bathrooms have been updated with stone countertops and floors. Some units have whirlpool tubs. 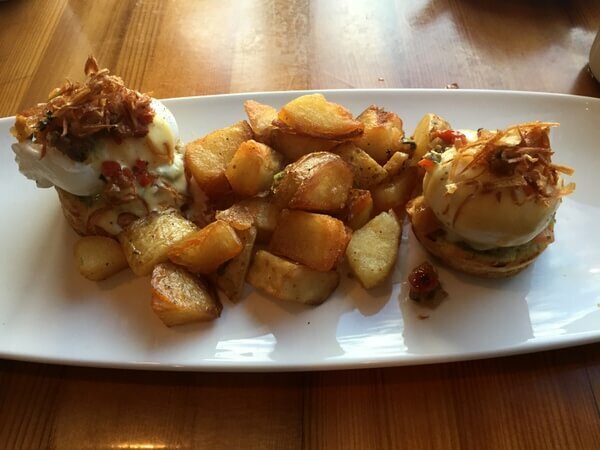 The Juniper Bistro is open for breakfast, afternoon snacks, and dinner. Unlike many hotels that offer self-service buffets, breakfasts at the Juniper are cooked to order. It’s not a speedy spot for a morning meal, but it’s a lovely location to linger. Among the breakfast choices are several eggs Benedict options (I can recommend the avocado Benny served with excellent hashbrowns). Another creative option was the stuffed French toast — a savory dish filled with bacon, gruyère cheese, and arugula with a sweet and sour tomato relish. The huevos rancheros, layered with smoked pork, refried beans, and a pineapple salsa, were interesting and delicious as well. I had dinner at the Juniper Bistro, too, and I enjoyed a Caesar salad topped with seared tuna and a sous-vide egg, wild mushroom gnocchi, and Moroccan-spiced lamb served with Israeli couscous. But that breakfast? Now that’s a reason to leap out of bed. Make your reservation directly with the hotel or you can book through Travelocity, Hotels.com or Expedia. 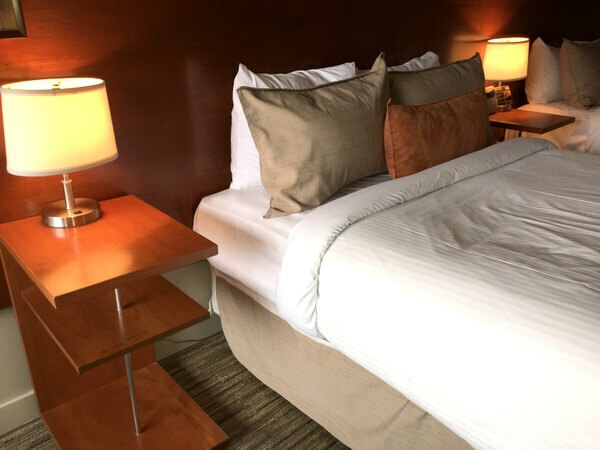 Hotel review by Vancouver-based travel, food, and feature writer Carolyn B. Heller, author of the books, Moon Handbooks: Ontario (now available in a brand new 2nd edition) and Living Abroad in Canada. Photos © Carolyn B. Heller. Travel Alberta and Banff Lake Louise Tourism hosted my stay and meals at The Juniper Hotel for review purposes.